For the past three years, the NESC has been evaluating a composite crew module as an alternative to the baseline Orion design. A tiger team was formed between Orion and the NESC team recently to compare opportunities and challenges. In 2006, the NESC studied the feasibility of a primary structure CCM for the Constellation Program Crew Exploration Vehicle. The overall finding indicated a CCM was feasible, but a detailed design would be necessary to quantify technical characteristics, particularly in the areas of mass and manufacturability. Subsequently, the NASA Administrator, Associate Administrator for the Exploration Systems Mission Directorate, and the Constellation Program Manager chartered the NESC to design, build, and test a CCM structural test article with the goal of developing a network of Agency engineers with hands-on experience using structural composites on complex habitable spacecraft design. 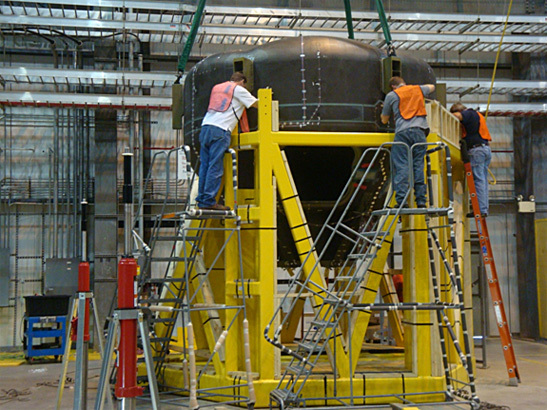 The NESC CCM Project was chartered in January of 2007, with a goal of delivering a full-scale test article for structural testing. The “as manufactured” full scale composite crew module primary structure with fiber optic and traditional strain gauges attached. Led by the NESC, the project team is a partnership between NASA and industry, including design, manufacturing, and tooling expertise. Partners are civil servants from nine NASA Centers – ARC, DFRC, GRC, GSFC, JSC, JPL, KSC, LaRC, and MSFC; the Air Force Research Laboratories; and contractors from Alcore, Alliant Techsystems, Bally Ribbon Mills, Collier Research Corporation, Genesis Engineering, Janicki Industries, Lockheed Martin, and Northrop Grumman. The CCM team operates in a virtual environment, electronically connecting participants across the country. During the design phase, the team constrained the design to match interfaces with the then current Orion crew module, including the internal packaging constraints that utilize a backbone for securing internal components. The team evaluated design solutions and focused on a design that utilizes aluminum honeycomb sandwich and solid polymer matrix laminate material systems. One unique feature of the CCM design was the structural integration of the packaging backbone with the floor and pressure shell walls. This feature provides a load path that accommodates load sharing with the heatshield, especially for water landing load cases. Another unique feature of the composite design is the use of lobes between the webs of the backbone. This feature puts the floor into a membrane type loading resulting in a lower mass solution. Connecting the floor to the backbone and placing lobes into the floor resulted in mass savings of approximately 150 pounds to the overall primary structure design. The design is constructed in two major components: an upper and lower pressure shell. The two components are joined in a process external to the autoclave to enable subsystem packaging of large or complex subsystems. The initial and preliminary design concepts were reviewed by an independent review panel in both March and June 2007. The team conducted building block testing of critical design and technology areas, which were used to validate critical assumptions and design allowables for the final design. The detailed design was reviewed and approved in December 2007 by an independent review panel. Full-scale fabrication of the upper and lower manufacturing demonstration units began in February 2008, and post-cure assembly of the demonstration units started in late May 2008. Manufacturing of the full scale test articles started in October 2008, and the assembly was completed 10 months later in July 2009. The project plans to statically test the combined upper and lower shell assembly to verify that the analysis models predict the response of the structure under load. The static tests will then be repeated with internal pressure up to 30 psi. Testing is scheduled to occur at LaRC in October 2009. At this stage of the overall Orion vehicle design, the CCM does not appear to offer significant mass or unit cost savings because of the complex nature of its design. 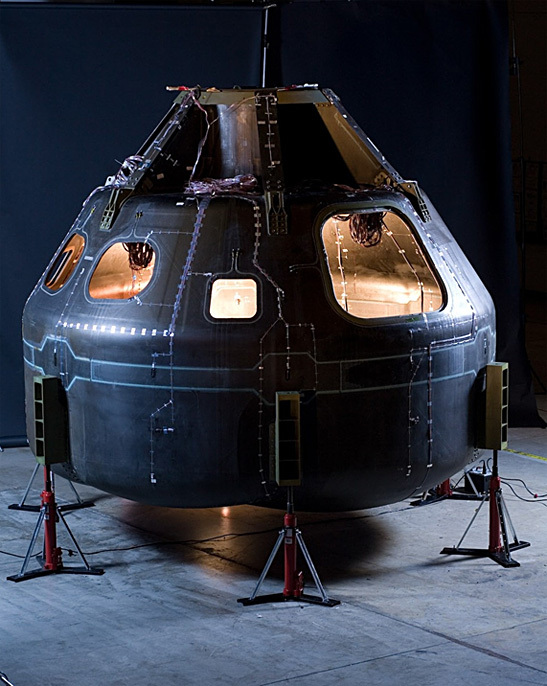 The CCM also posed a significant threat to the Orion schedule because of the manufacturing changes required by composite versus metallic materials. However, because of the advantages of the split clam shell design found on the CCM, the Orion project is considering adopting this approach for their aluminum-lithium configuration. Design lessons show that non-autoclave splices allow concurrent fabrication, assembly, and integration of major structural components and subsystems. The splices also provide a lower cost cure tooling option. Through the use of complex shapes enabled by composites, a membrane lobed floor integrated with backbone subsystem packaging feature offers a weight savings. A honeycomb core, combined with mature secondary attachment technology, provides flexibility and robustness in secondary attachment locations. As loads and environments change with program maturation, inner mold line tooling offers the opportunity to optimize or change design through tailoring of layups or core density. Composite solutions offer opportunity for lower piece-part numbers, resulting in a lower drawing count which helps minimize overall life cycle costs. Also, a minimal number of tools are required to manufacture the primary structure. Throughout the manufuacturing phase, a number of “unknown unknowns” materialized giving the team the opportunity to evaluate and demonstrate the inspectability and repairability of the CCM design. These lessons learned directly fed the design (or Orion and Ares composite designs) as well as the operations planning being developed by the Constellation Program.